The egg is the ultimate stem cell. It has the potential to launch the next generation and give rise to every cell lineage in the adult organism, sometimes even without fertilization. To accomplish this, the egg must execute three tasks, and my laboratory focuses on the questions that arise from these tasks. First, the egg must reduce the number of chromosomes by half through a process called meiosis. During this process, the genome condenses to form chromosomes, structures that usually restrict transcription of mRNAs. Yet, eggs of various species, including humans, find a way to continuously synthesize mRNAs in spite of this condensed DNA state. We are investigating how mRNAs are synthesized during the process of meiosis. Second, the egg must synthesize a trust fund of mRNAs and proteins to sustain early embryogenesis. Upon fertilization, these synthesized mRNAs are translated into proteins that help specify the different cell types of the early embryo. We ask how mRNAs are deployed at the right time and place for utilization during development? Lastly, the developing egg communicates with the surrounding soma to regulate its own development and we are investigating the mechanism of this communication. Addressing these questions will allow us to potentially target therapies to influence female fertility and developmental defects. We investigate these questions utilizing the female germ line in the developmental context of the fruit fly, Drosophila melanogaster, due to the availability of mutants, markers and genetic tools. We are able to study each aspect of the egg life cycle – initiation and maintenance of egg fate, as well as how the egg differentiates into various somatic cells post-fertilization. It has been shown that many of the mechanisms that govern these processes in Drosophila are widely conserved, thus making the findings in our system broadly applicable. How are mRNAs synthesized during the process of meiosis? How are mRNAs translated at the right time for utilization during development? 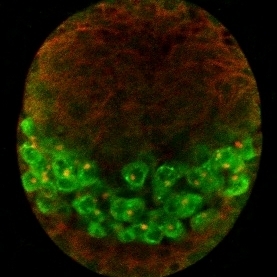 How does the developing egg communicates with the surrounding soma to regulate its development?